Closet still looks messy after installing a closet organizer? Does it not look as nice as the promotional pictures you've seen? What's the difference? The right hangers can give your closet a neater appearance. Let me show you why and some other tips. When I was looking around for ideas to design a http://littlebitjohnny.blogspot.com /2013/01/step-in-closet-organizer-plans.html">closet organizer for my coat closet it struck me how my closets didn't look as nice as the product photos even though I have closet organizers installed. I knew my closets wouldn't look as good as those product photos. I mean, my clothes are things I wear, not props I add to make my closet look nicer. But there was one simple and relatively inexpensive thing I could borrow from those staged photos to make my closet more visually appealing. Get new matching hangers! Your closet is one of the first things you see every day. Having a neat, organized closet that's visually appealing which allows you to quickly find the clothes you want can really help you start off your day on a positive note. At the very least it will be one less frustration in your hectic day. Imagine you walked into a shop and they had a rack of shirts using a mix of a dozen different types of hangers and the display looked messy. How would it make you feel about the clothes you were buying? When you open up your closet door do you want to feel like you're in a thrift store or a high end retailer where the clothes probably came from? Keep clothes from getting wrinkled, crushed or misshaped. Make it easier to find what you're looking for. Make it easier to put your clothes away so you don't wind up with your shirts on your footboard and your jeans pilled up in a corner. From a visual perspective, it would be nice to have all the same hangers, but there are some hangers that are better suited to certain types of garments than others while still keeping costs down. My goal is going to be to get all the same type of material for particular types of clothes and have all the hangers at least have a chrome hook for uniformity. Wire hangers are great for all sorts of things. They can help you unclog a sink, fish wire through walls, unlock your car door if you locked yourself out, you can even make an HDTV antenna out of them, and they're a cheap way to transport your clothes from the dry cleaners. They're not so great for your clothes. Over the years wire hangers have been getting thinner and weaker. They don't distribute the weight of the garment over a large surface area and aren't always wide enough which can cause indentations in the clothing. Apparently the metal can even discolor some fabrics, which is why when you get your clothes from the dry cleaners, there's sometimes a paper sleeve over the hanger or some cleaners use coated hangers. Keep some wire hangers around because they can come in handy for different things, but once you get your clothes home from the cleaners, put them on better hangers. On your next trip to the cleaners, bring back your last set of wire hangers and see if they'll take them back so they don't wind up in a landfill. From what I understand many cleaners will accept them. If for some reason you must have wire hangers (packing in a travel garment bag for instance) these Organize It All Chrome Hangers look nicer and stronger than the ones you get from the dry cleaner. These are better for your clothes than wire hangers and most of my closets were filled with them. They're not horrible but over the years you pick up some from the drugstore, the supermarket, and other locations and you wind up with a bunch of slightly different hangers in a rainbow of colors. It destroys the uniformity I'm looking to achieve. Getting all new plastic hangers that are the same size and color is an option but it seems like a waste. If I'm going to replace my hangers I want to replace them with something better. Another problem with plastic hangers is some hangers wind up becoming different sizes and shapes, over time some of the hanger hooks have deformed resulting in an uneven appearance that makes the closets look cluttered. Hanging heavy items, such as jeans, on the bar of the hanger can also cause them to deform as can be seen in the photo above. These new types of hangers appear to be very popular. They have a chrome hook, which fits with my design goal, and the body of the hanger is a thin plastic that has a flocked surface. Think of the inside of a jewelry box. This velvet like surface provides friction to prevent clothes from slipping. They also have little indentations to hold on to clothes with thin straps so your tanks and spaghetti strap dresses don't wind up on the floor every time you look at them funny. They're reasonably priced and have a lot of good reviews. The only big downside is that if you put wet clothing on them it can cause the color of the "velvet" to transfer to your clothing, or otherwise damage the textured coating. I usually hand wash my workout clothes when I'm done with them then throw them on hangers and allow them to air dry. I'm going to need to keep a few plastic hangers around for that. I purchased some velvet hangers to see what all the rage was about and I have to admit I'm pretty happy with them. I think they will make a good general purpose hanger for shirts and other tops. 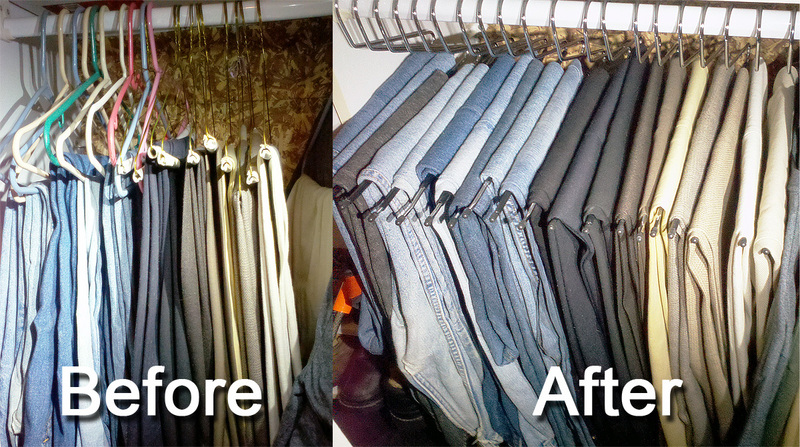 I replaced some of my plastic hangers with these velvet hangers and there's a big difference in the before and after photos. You can see that the shirts line up better when they're all on the same type of hanger. The collars and shoulders are more in alignment. The shirts also sit better on the hanger and don't move around when I hang them on the rod thanks to the non-slip velvet texture. It makes it easier to find the shirt I'm looking for and the shirt doesn't slide around as I put it back on the rod. While I had the closet cleared out I had washed and ironed these particular shirts and hung them up carefully (I didn't mess them up for the photo) yet they still look like a mess compared to how they look when transferred to the velvet hangers which I didn't take much care in hanging up. Velvet hangers claim to save space but I didn't see much in the way of space saving compared to the plastic hangers when the shirts hang naturally. If I compress them they probably take up less space than tubular hangers but I like to give my clothes room so that air can circulate and they don't wrinkle. 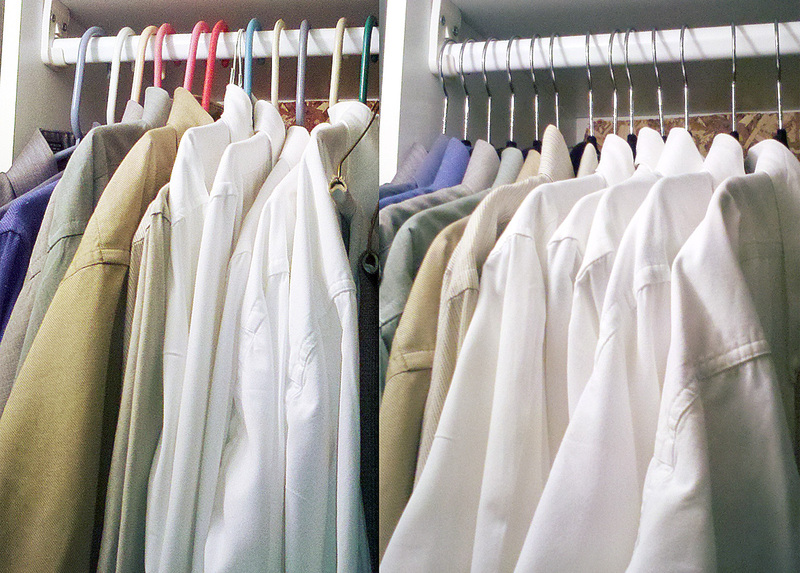 Even without the space savings the shirts hang much nicer and make the closet look more tidy. General purpose hanger can be used for shirts, jackets, suits, folded pants, etc. Costs less than suit hangers. No cross bar for pants. Good for shirts and other tops and dresses. If you hang your pants or long dresses without folding them to avoid creases, these come with clips. You can also get Finger Clips separately to add to your velvet hangers that enable you to hang pants and long skirts without folding them. 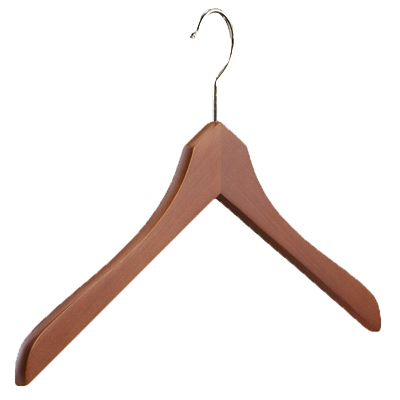 If you want to feel like you're looking through the racks of a high end clothing store when you're selecting your outfit for the day there's nothing better than real wood hangers. They add a touch of elegance to your closet. People who market closet organizers seem to understand this because every single product photo I've seen for closet organizers used wooden hangers. They are available available in a number of different colors to match your closets decor as well as unfinished aromatic cedar . For shirts and other tops these Honey-Can-Do Wood Hangers with Non-Slip Grooved Bar seem like an attractive option. They are available in maple and cherry and are one of the most affordable wooden hanger options I've seen. They come with a bar for pants and are labeled as suit hangers but some reviewers claimed that the bar wasn't sturdy and just stapled on. Honey-Can-Do offers a limited lifetime warranty on these hangers which does give me some piece of mind. These are very affordable wooden hangers and you're going to have to expect certain things. The finish on them doesn't seem to be applied very well. The finish on the top of the hanger appears to be smooth but on the front and back there are some rough spots. For the price though, they're a very good value. If you want to purchase a lot of wooden hangers these The Great American Hanger Company 200202-100 Wooden Suit Hangers come in sets of 100 and appear to be good quality at a great price. The quality of the wooden hangers I mentioned above are adequate and about what you can expect for hangers in that price range. If money is no object and you want the best hand made, hand finished that money can buy visit Butler Luxury. What's surprising about these hangers is how affordable they are. Okay, they're not cheap compared to the wooden hangers above that can go for less than $1 each but compared to other high end hangers from The Hanger Project or Beverly Hangers, they're in the same ball park. That's quite a feat considering the Hanger Project and Beverly Hangers are machine manufactured in China while the Butler Luxury hangers are hand made here in the good 'ol US of A. Check out Gentleman's Gazette for a full review of Butler Luxury Hangers. I previously made the mistake of thinking that Butler Luxury Hangers were made in the USA but received this information from the Mike Cregan, owner of Butler Luxury. Our hangers are made in a facility in China. However, what is true is that our facility is like no other China. Nearly all hanger factories are all in the same area and feed off each other. Our shop is about 1500 miles from the others, uses highly skilled craftsmen and has better conditions. It is the same place where the shop makes hangers for Prada and Zegna. It is highly specialized for only cutting edge quality hangers. No others. Your standard triangle shaped "suit hanger" can serve most purposes but there are benefits to getting specialty hangers for different types of clothes. There are three basic types of pant hangers, an open ended bar hanger, a clip top hanger as well as using clips on a standard suit hanger. You my need more than one type depending on your wardrobe and how you like to hang your pants. One tip that can be used for all pants hangers though is to hang your pants with the crotch facing the back wall. It helps make everything look more uniform. If like me, you fold your pants on hangers, these open ended hangers both look nice and are very functional. I ordered a couple dozen of the Jobar Slacks Easy Slide Hangers to hang my slacks and jeans. I was a little concerned by some of the negative reviews on them but the other brands were much more expensive. These are far and away the hangers that made the most difference in my closet and their quality seems very good. I used to hang my jeans on the bar of plastic hangers and my dress pants usually stayed on the hangers that came from the dry cleaners. The wire hanger with the cardboard tube over the bar seemed to do well to keep the pants from sliding off the bar and onto the floor when I was shuffling through them looking for something to wear. As you can see though, they looked sloppy and the weight of the jeans would distort them. The Jobar slacks hangers have a few great benefits. There is a ribbed plastic or rubber sleeve over the bar that provides friction to keep the pants from sliding off the hanger. The hangers are chrome plated so they match up well with the chrome plated tops of the Velvet Hangers I purchased. They seem very durable and have no problem holding up heavy jeans. I even put 4 pairs of jeans on one hanger and the hanger could handle it. They can even be used to hang folded sweaters or shirts on the bar better than suit hangers. It's easier to take pants off the hanger and put them back on compared to standard suit hangers. You don't even need to take the hanger off the closet rod. It's easier to see which pants are which because the view isn't obstructed. This is especially helpful for me as I have my pants hanging on the lower half of a double hang rod section. The pants sit up higher off the floor compared to suit hangers which makes a much nicer space below the pants for additional shoe storage. There is enough clearance to easily see the shoes. This alone makes the purchase of the hangers worth the cost in my opinion. One of the major complaints in the reviews were that they weren't long enough. The Jobar pant hangers I received have no problems holding the size 34 waist pants that I have hanging on them and there's room to spare. The bar is 12" long (13" if you count the bent up end portion) so if you have any concerns fold your pants over a hanger you already own, take a tape measure and measure the width of the pants at the hanger bar. If your pants are too wide to fit on the hangers and you didn't get a small size by mistake, think about exercising more or get rid of the MC Hammer pants. The specifications for the other hangers (like these Whitmor Chrome and Foam Collection Slack Hangers which have a foam instead of plastic cover) don't seem to be substantially wider than the ones I purchased except for maybe these Closet Complete Foam-Coated Chrome Non-Slip Pants Hangers which might be a little bit bigger. Skirts and Shorts can also be hung using these types of hangers in double hang sections. Some of my cargo shorts and bike shorts are especially hard to fold and I'm planning on getting clip top hangers for these. I still haven't decided which ones. Either chrome and black ones that match the slacks hangers or wooden ones because the wood will be visible and provide a more pleasing appearance. These are the ones I'm considering. The main reason I wouldn't use the wooden hangers above for suits is I prefer the curved, wide shoulder suit hangers like these Whitmor Natural Wood Collection Deluxe Suit Hanger . These are the types of hangers that my suits came with. They help preserve the shape of the suit. These are not to be confused with the cheaper contoured wood hangers which have a curved shape but not the wide shoulder pads. They're not cheap but $15 for a hanger doesn't seem so bad when you're considering you're putting a suit or jacket on it that you paid hundreds or thousands of dollars for. If you have a few suits and jacks I did see these Proman Products Libra Wide Shoulder Suit Hanger w/PVC Ribbed Bar that are less than $6 each when you purchase a set of 12. The Honey-Can-Do Wood Wide Shoulder Suit Hangers comes in a 2 pack for around $12 but I could only find them in black. The Whitmor Cherry Wood Collection Suit Hanger is less than $7 each currently but I was hoping for a light colored wood. I guess I'd have to spend a little more to get the cherry flat hangers to match. If the wood hangers seem too expensive, there's always the plastic broad shoulder suit hangers which are a fraction of the cost. Your suits and jackets should last you a long time if you take care of them and you should invest in decent hangers for them if yours didn't come with proper hangers. For delicate fabrics like silk, satin and lace, padded hangers are recommended. They help protect delicate and expensive blouse, lingerie and other items such as sleepwear. They all have similar designs, a hook and a padded arm with a bow in the middle. Some are covered in canvas, others in linen but most seem to be in satin. They're all very feminine looking but you know what. Us guys can have silk shirts, silk and satin pajamas too. A black set or canvas covered padded hanger might be a little more masculine looking. You can even clip the bow off if you want. You have finished reading Clothes Hangers: What You Need To Know and many articles about Tech Gallery in our blog this, please read it. and url link of this article is https://littlebitjohnny.blogspot.com/2013/01/clothes-hangers-what-you-need-to-know.html Hopefully discussion articles on provide more knowledge about the world of new tech gadgets.